Yesterday Maggie, Jenny and I were privileged to attend an African wedding. 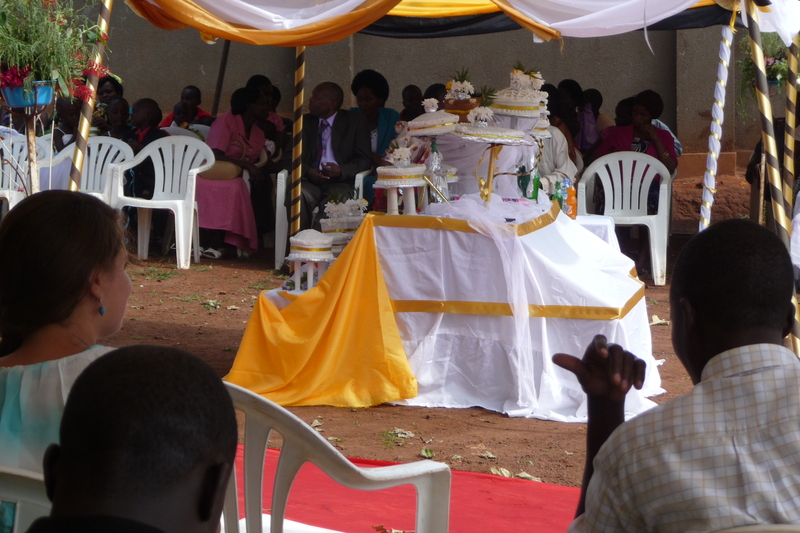 We were invited by the bride’s parents who direct YWAM Uganda. It was the most relaxed affair of such importance that I have attended! The night before we still didn’t know exactly where it was to be held, what we were expected to wear or bring nor what time it was to commence. Luckily Eric, a fellow YWAMer from Arua and part of the wedding party, was to stay at the Jinja base the night before. Only thing was… he didn’t know any of the particulars either! We went to bed Friday night waiting for Eric to call and woke up at 6:45am to Jenny telling us Eric had called and we were leaving at 7:30. We ended up walking out of the base at 7:55 and headed towards the main road. Half an hour later we were at the taxi stand. The taxis are mini buses that they cram with as many people as possible. They are cheap and convenient modes of transport. A half hour trip into town followed and from there we took another communal taxi out to Kamuli, a further 1 ½ hour trip spent with four people to a bench-seat. Arriving in Kamuli we proceeded to the home where Esther, the bride, was getting ready. Despite not knowing anyone, we were warmly welcomed in. It was 11am when Eric informed us that the wedding was to commence soon but as, “no one is here yet” and “African weddings can take a while”, he advised us that we should go and get some lunch! We walked the short distance from the house to the main street in search of food but instead found the wedding party that had travelled from the Arua base. Eric introduced us to some of the party and Jenny introduced Maggie and I to Pastor Sam, the Father of the Bride. We then hopped into the mini bus with the rest of them and went to the church. At the church I felt the words of Christ in Luke 14:8-11 was appropriate: “But when you are invited, go and sit in the lowest place, so that when your host comes he may say to you, ‘Friend, move up higher.’ Then you will be honored in the presence of all who sit at table with you.” We started in the very back row of the church, were told to come down to the middle, and then finally pulled up by Agnes, the Mother of the Bride, to sit in the fourth row. This placed us only behind the bridal party and parents! Talk about humbling! I felt like a royal wedding crasher! And yet in true Ugandan style we were made to feel like we belonged and had every right to be there! The ceremony was not dissimilar to our own. It commenced with worship, the bride followed her bridesmaids into the church, there was an exchanging of vows and rings, prayers and a sermon. They signed the register and proceeded from the church for photos. The only difference was it took 3x as long and there were lots of “ay-yi-yiiii”s amd “ay-eeee”s! We were also invited to the reception which was similar again to what I would expect back home, except this time 3x shorter! Esther and Dan with the rest of the bridal party arrived after us. They began serving our meals before they arrived. We had flavoured rice with about 3 types of meat and cabbage. It was really good! When the bridal party arrived, the bride and groom cut a ribbon between an arch and passed underneath. They then cut the cake and brought it around on a plate, serving their guests. The bridal party then ate their meals, speeches were said, gifts exchanged and before we knew it the party was splitting up! Thank you to Esther and Dan for letting us gate crash your wedding! We pray blessings upon your marriage and ask that God will bind you together in unity, love and servanthood. It was a privilege to be part of such a special occasion as two believers became one.